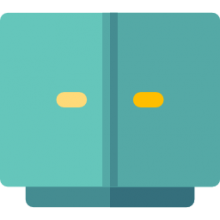 Pantry cabinets, also known as storage cabinets are freestanding units that are typically made of some form of wood- often panel board (Source). They are designed to provide additional utility storage for a space. They are most commonly used as a freestanding kitchen pantry, but have the potential to be used anywhere that extra storage is needed such as the bathroom or bedroom (Source). They usually have multiple shelves and closing doors. These portable pantry cabinets help you to utilize the full potential of a space. Their shelves allow you to store food, towels, clothing, appliances, or whatever else you may need additional space for (Source). The doors on these freestanding kitchen pantry cabinets allow you to keep the things you’re storing out of view to create a cleaner appearance in the room with less clutter. The ClosetMaid Espresso Pantry Cabinet 3.7 $ 24" x 12.5" x 59.5"
The Tall Target Adjustable Shelving Storage Cabinet 3.6 $ 23" x 12" x 48"
The South Shore Storage Pantry 3.5 $$ 23.5" x 11" x 61.9"
The Sauder Storage Highland Oak Cabinet 3.4 $ 29.6" x 16.1" x 71.1"
The Sauder Double Door Storage Dakota Oak Cabinet 3.7 $$$ 35.4" x 17" x 71.2"
Buyers suggest that you anchor your portable pantry cabinet to the wall. This will prevent the pantry cabinet from being able to tip over and cause potential damage or injury. Some buyers that placed their pantry cabinets in areas where they were unable to anchor them to the wall said that you can put heavier items in the bottom of the pantry cabinet to also help prevent the risk of the pantry tipping over. One buyer also suggested that if you’re putting your storage cabinet together by yourself that it makes it easier to install the doors if you first lay down your storage cabinet with its back on the ground. One thing that’s definitely worth considering when shopping for free standing pantry cabinets is the appearance. Colors (white, black, and wood-grain are common options) as well as classic & modern designs are worth considering. A nice and very simply designed option is the ClosetMaid Pantry Cabinet. 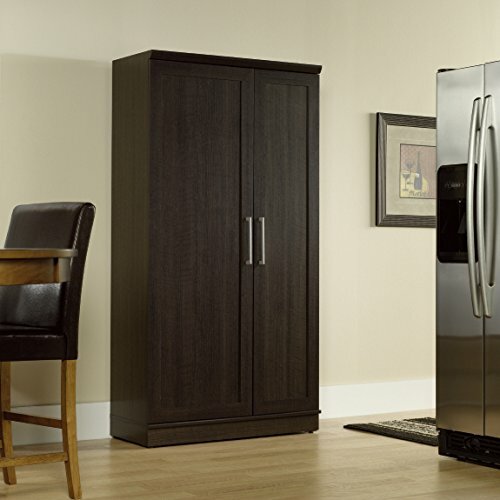 Another simply designed option with just a slightly more upscale appearance is the Sauder Double Door Storage Cabinet. The South Shore Axess Storage Pantry provides a more modern look, while the Sauder Storage Cabinet with the Highland Oak Finish has a slightly more rustic feel to it. 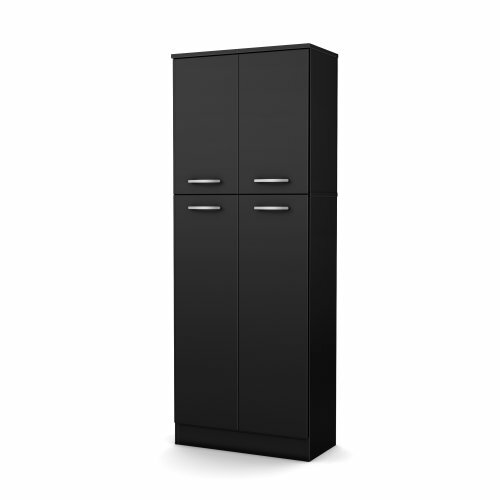 For a higher end look, you can consider the Target Marketing Systems Tall Storage Cabinet. Another important consideration when choosing a pantry cabinet is, of course, the size. The smallest option on the list is the Target Marketing Systems Tall Storage Cabinet at 48” x 23” x 12”. The largest storage cabinet is Sauder’s Double Door Storage Cabinet, coming in at an impressive 71.2” x 35.4” x 17”. Both the Sauder Double Door Storage Cabinet and the Target Marketing Systems Tall Storage Cabinet include 2 adjustable shelves as does the ClosetMaid Pantry Cabinet. The other two pantry cabinets on the list, however, have 4 adjustable shelves each. Both the South Shore Axess Storage Pantry and the Target Marketing Systems Tall Storage Cabinet have 2 separate sections with 4 total doors unlike the other choices on the list that have only 2 doors. If you are looking for a top-rated pantry cabinet, you might want to consider this one offered by ClosetMaid. Users love this space saver, but some do complain about the quality. This product provides a place for storing items in your kitchen, bathroom and even your laundry room. It comes with 2 fixed and 2 adjustable shelves. The unit is made of laminated wood and is easy to assemble. It is available in three colors: espresso, dark cherry and white. This item seems like a solid choice if you want a piece of furniture for storing canned foods, storage containers, cookbooks, cleaning supplies and the like. The general user consensus concerning the ClosetMaid pantry cabinet is that it is great for apartments with limited storage. They add that it is sturdy enough for canned goods and easy to put together. However, some buyers complain about the poor quality. Some users complain about it not being very sturdy. This storage cabinet offered by Target Marketing Systems is a solid option if you want to keep your kitchen supplies neatly organized. Users love the looks of this product, but some do complain about the quality and the size. This product features two adjustable top shelves and one bottom shelf. With subtle design elements, the cabinet seamlessly fits in with any home décor. It is made from a high-quality wood and is easy to clean and maintain. 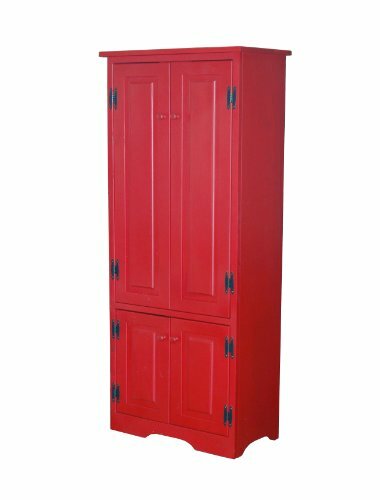 The cabinet is available in three colors.This storage cabinet might be a good choice if you want to create a functional kitchen, laundry or utility room. In general, users have a favorable opinion of the Target Marketing Systems pantry cabinet.What they praise is that it looks cute and is easy to put together. However, many buyers complain about it being cheaply made and lacking sturdiness. Several purchasers say that it is a little too small for the price. This storage pantry offered by South Shore is a solid option for those who are short of storage in their kitchen. Users like the capacity of this product, but some do complain about quality and durability issues. This product features 5 closed storage spaces, which are ideal for food and kitchen accessories. It has 2 small and 2 large doors for easier access. The unit features 4 adjustable shelves that can support a weight up to 15 lbs. each. It is available in 8 colors. This product might be a solid choice if you want an easy-to-assemble pantry that holds a lot of items. In general, users have a favorable opinion of the South Shore pantry cabinet and they agree that it is a good value for the price.Many of them state that it is sturdy, holds a lot of food and that it is easy to assemble. However, some purchasers complain about the poor quality of the product which seems to not be very durable. This storage cabinet offered by Sauder is a solid option for those who want a practical and good-looking pantry cabinet.Users like the practicality of this product, but some do complain about the poor construction. This product features four adjustable shelves and a full-width upper shelf. 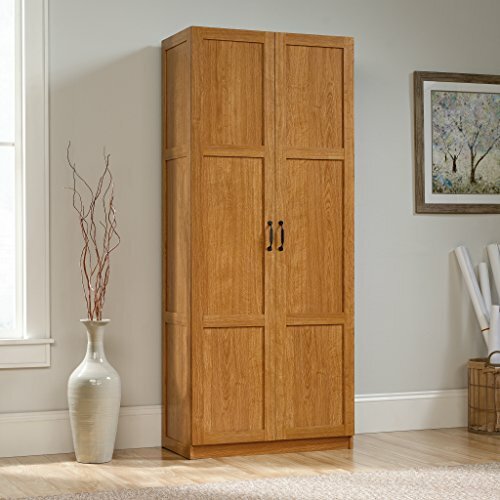 The Sauder tall cabinet with a golden Highland Oak finish has ample room to stash clothes, blankets, pantry items and more.This item could be a solid choice for those who need a storage solution for their kitchen, basement or garage. In general, buyers have a positive opinion of the Sauder Highland Oak Finish Cabinet. They state that it is both attractive and functional. Users agree that it is fairly easy to put it together thanks to clearly-labeled parts and extremely easy pictorial instructions. However,some buyers complain about not sturdy enough construction. They say that the unit looks a little flimsy. One dissatisfied buyer says that the product is very light-duty. 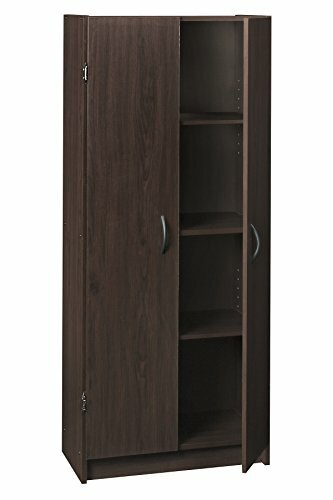 If you are looking for a pantry cabinet, you might want to consider this double door storage cabinet offered by Sauder.Users like its functionality, but some have complaints about receiving a defective product. This product features two adjustable shelves and one fixed shelf behind each door. Plus, its swing outdoor features three adjustable and three fixed shelves.The storage doors can be customized to your needs by choosing if you want them on the right or the left. If you are looking for a functional storage solution for any room in your home,this might be a good option. In general, users are happy with the Sauder double door storage cabinet. What they like in particular is that the doors are customizable and that the unit is very space efficient. They agree that it is a nice looking cabinet, as well as that the instructions are very clear, with good illustrated step by step instructions. However, some purchasers complain about receiving the product with broken or missing parts. One buyer states that the cabinet is made of particle wood so it can be a little fragile. It's best to consult the product page for specific details if you have any of the common concerns below. Exactly what are the cabinet's shipping package size and dimensions? Can you purchase additional shelves and dowels? What's the weight limit of the shelves? Can some shelving be kept out to ensure that brooms and mops can easily be kept the cabinet? Are the door hinges reversible? How hard is it to assemble and are there assembly instructions? How high is the inside of the bottom cabinet? How tall is the completed cabinet?